I have really mixed feelings about this book. I really want to love it- it really was a great story. It was fast paced the entire way through and was a very short novel. I loved that the book didn't feel like a dystopian. It didn't copy cat from The Hunger Games, Divergent, Matched, Blood Red Road or any of the dystopian books out there. I also liked that the book started very mysteriously. I honestly had no idea what was going on until a few chapters into the book. Juliette is a strong and smart character- she isn't a pansy! She is a girl who has grown up without being shown any love or affection. Suddenly, she has a person in her life who truly cares about her- that is an incredible thing and she has no idea what to do with it. The only problem that I had with this book (and there may be spoilers here, so if you don't want spoilers- please don't read on)..... a girl can take the life and powers out of a person by simply touching them- a touch too long and they can be killed. She has no love, her family is terrified of her.... she is eventually brought to a place where everyone has superpowers and she is given a spandex cat suit and gloves to be part of the "team"..... sound familiar? Sound like Rogue from X-men? I am sure that the author didn't mean to have a book so similiar to Rogue's character- and even if she did, why not? She is awesome. But it did bother me a little- that it was SO similar. I don't think she copied or anything like that; I was simply caught off guard and unsure what to do with that thought. 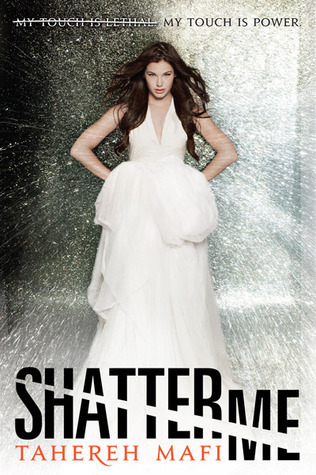 If you are a fan of superhero books that are light on the dystopian- you will enjoy Shatter Me.